19" x 28.5" image on 26.25" x 36.5" paper. Packing, shipping and insurance for UPS ground or USPS will be $15. For orders up to 10 posters, the shipping charge will be the same as for one poster. 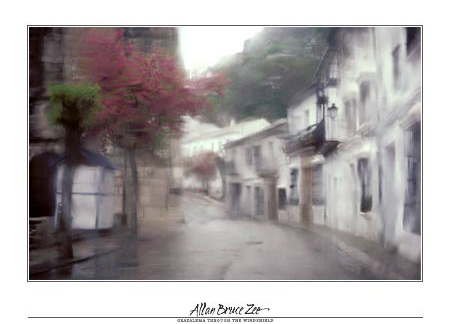 Grazalema through the Windshield was photographed in one of the picturesque White Villages of southern Spain. We were travelling in a torrential downpour that day. I noticed that at a certain point after the wipers were shut off, the film of water built up to give just the right amount of diffusion not too clear and not too fuzzy. I experimented with a few shots and then on the way out of town we approached the village square where beautiful trees were blossoming in front of the church. I stopped the car in the middle of the street, shut the wipers off, pressed the camera to the windshield and snapped one shot before we had to move on. Since I usually set up the camera on a tripod and take a lot of time with each image, this was quite a divergence from the way I typically work. There are lessons everywhere.